Gilli Lawa Laut is located at the northern end of Komodo Island. 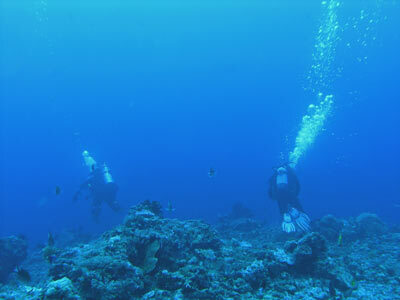 To the north of this small island there are a number of excellent dive sites. 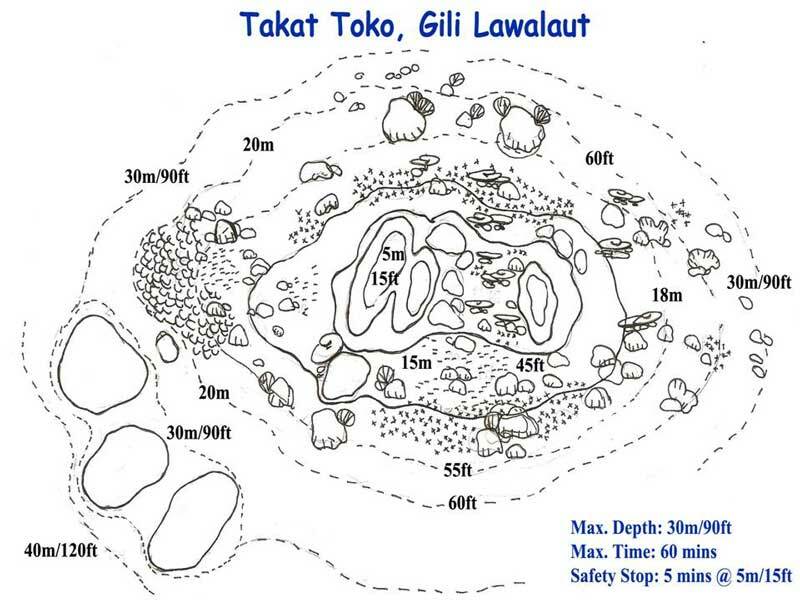 Takat Toko (Castle Rock) is located about 2.2 kilometres off the northern side of Gilli Lawa Laut. 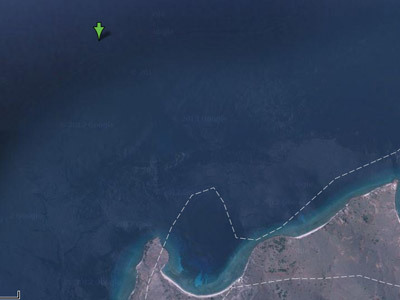 An approximate GPS mark for the dive spot is 8º 25' 50.6"S 119º 33' 36.5"E (using WGS84 as the datum). The site is towards the shore from the GPS mark. The actual site is an underwater sea mount that comes up from perhaps 40 metres to about five metres. The site is prone to currents and they can get very strong. This site should be dived with care, especially if you are diving from your own yacht. As with virtually all dive sites that you do when on MV Mermaid II, you use the RIB (rigid inflatable boat) to get to the start of the dive (and also to get back to the boat). The RIB will drop you normally up current of the shallowest point. If the current is quite strong, they will have to drop you as much as a 100 metres away. The currents seem to flow east to west or west to east. The aim of this dive is to head to about 25 to 30 metres and then hang in the current and watch the large pelagics that visit this site. The current was extremely strong when we did it. Once we were in the water we dropped straight away to the bottom without stopping for any time on the surface. Unfortunately, Kelly had ear problems and could not get down. I reached the bottom at 15 metres and waited and waited for her to come. She tried a couple of times, getting picked up by the RIB and dropped off again, but she failed to get down. Meanwhile, I waited for a few minutes and when she does not arrive, I go forward. I know that she has probably had ear problems as it is a common occurrence. It is very hard work to make headway, the current is over one knot, possibly as much as 1.5 knots. Finally after a lot of effort (remember I had a camera in one hand) I make it to the viewing spot and hook in with my reef hook. It has taken me 10 minutes to get to 23 metres. Straight away I see sharks and some large fish. 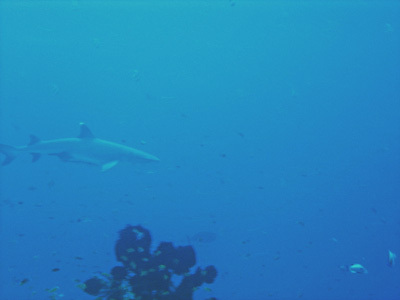 Although the visibility is excellent, the sharks are almost out of view. I have used a large amount of air getting down and it really is an effort to stay in the one place with a camera taking up one hand. I watch for about nine minutes and then decide to head back to the shallowest part of the site. It is easy to drift back and once behind the sea mount everything is a lot easier. I gradually ascend to the top and spend four minutes here before surfacing. This was not a fun dive, a very hard effort. My air consumption was over 25 litres a minute, which is well over double the amount of air I would normally use on a dive. The visibility was probably 30 metres and the water temperature was about 27ºC. Click here to return to see the dive profile from my computer.